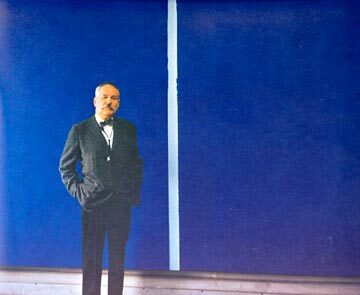 Coming of age as an artist in the atmosphere of moral crisis that, in America as elsewhere, pervaded the post-war period, Barnett Newman believed that a completely new art was needed. After studying at the Art Students League, New York, in 1922 and again in 1929, Newman destroyed most of his work and stopped painting from 1939–40. In his view, Western art – sidetracked by a search for beauty and formal perfection – had lost contact with "man's natural desire for the exalted, for a concern with our relation to the absolute emotions." Newman felt that an art of the sublime was both necessary and possible in his time, but that to achieve it artists would have to free themselves from the past and paint as if painting had never existed. "Instead of making cathedrals out of Christ, man, or 'life,'" he wrote, "we are making it out of ourselves, out of our own feelings." Newman's artistic response to the revolutionary project he had articulated are found in The Plasmic Image, a series of essays in which he grapples with the subject matter of the new abstract painting. Three essential ideas shaped his thoughts and work. The first, derived from the writings of the Russian anarchist Peter Kropotkin, was his belief in the responsibility of the individual to free himself from all dogma, whether of the right or the left. The second, inspired by the Kwakiutl art of the Northwest Coast, was his understanding that the abstract shape had its own reality and could convey ideas and feelings directly, without reference to the visual world. The third, occasioned by his reaction to Indian mounds seen on a visit to Ohio, and later deepened by his insight into the Jewish mystical concept of makom – the "place" where God is – was his desire to create a sense of place in his paintings that would have a similar mystery. This feeling of being located was, for Newman, the fundamental spiritual dimension of art; by his attention to place in his paintings he hoped to give the viewer a "feeling of his own totality, of his own separateness, of his own individuality, and at the same time, of his connection to others, who are also separate." 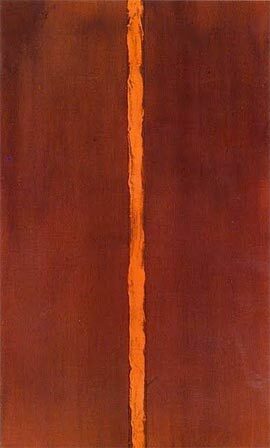 Newman had a solo ehibition at the Betty Parsons Gallery in New York in 1950 and a second one in 1951. During the first solo exhibition, a written note advised the viewers to stand close to the works so that they could engage the surfaces of the paintings.The second solo show included Newman’s first 8-foot by 18-foot painting. It received poor critical reception from the press as well as some of his friends. Newman therefore withdrew all his paintings and decided never to exhibit again in a commercial gallery. In the summer 0f 1959, Newman visited Canada and led a summer workshop at Emma Lake, Saskatchewan, where he greatly impressed many Canadian artists. In his work, Newman gave much attention to the precise physical qualities of his paintings. He began working with a new acrylic paint known as magma. He combined this synthetic pigment with oil or tempera to achieve chromatic contrasts of opacity and depth. He gave expression to the idea of place by dividing his canvases with a narrow, vertical band of colour that he called a "zip," suggesting its ability to activate the surface of the painting. He explored the use of a very wide "zip" (symmetrical bars of colour) in the work The Way I. 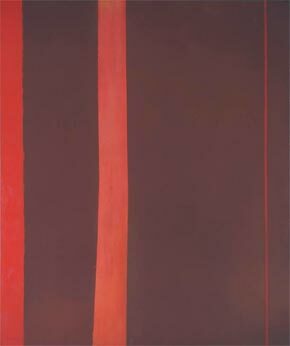 In 1967 Newman painted Voice of Fire for the American pavilion at Montreal's Expo 67. At this time Americans were confronting the moral dilemmas raised by the war in Vietnam. According to the artist's widow, he was deeply preoccupied by the conflict. The painting does not allude directly to the war, but by making each viewer conscious of where he or she stands, it opens up a moral and spiritual dimension that is profoundly expressive of its place and time. In Voice of Fire the "zip" is the red band that is placed exactly in the middle of the blue ground. In 1968, Newman painted Yellow Edge. Thought to be his last work, it consists of a single narrow band of yellow on a black background. It was painted in the work-room of his apartment. Newman died of a heart attack on 4 July in 1970.